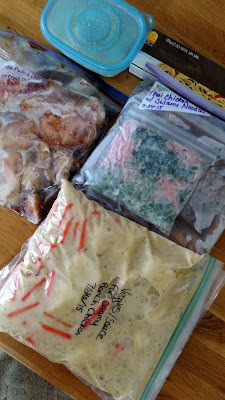 I love sharing recaps of my freezer swaps with you. It's been quite awhile since I've last hosted one. I know life is extremely busy for so many of us and its hard to find a day that can work for everyone. I also forget that we don't always have to go on these six hour cooking sprees either. My latest swap was very small but still fun and beneficial nonetheless. A couple weeks ago I gathered three other ladies and we decided to prepare one main dish each times 4. But all on our own time and then met at my house to exchange. It works really well to do it this way, then others don't feel pressured to commit to a whole afternoon of cooking. Mix dressing and soy sauce in a bowl. 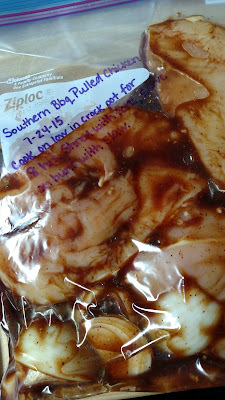 Pour half of dressing over chicken and place into a large gallon freezer bag. Add peanut butter, honey and crushed red pepper to remaining half of dressing mixture. Put into a sandwich sized baggie. Place remaining ingredients in a sandwich sized bag. Put all bags together in one gallon freezer bag. Thaw and cook chicken in a skillet over medium high heat for eight minutes or until cooked through. Cook pasta according to package directions. Place pasta, chicken mixture and remaining ingredients in a bowl and toss lightly. Serve immediately. Combine all ingredients together in a bowl, except chicken and buns. If freezing, place chicken breasts into a gallon freezer bag. Pour sauce over chicken. Remove as much air as possible and seal shut. Lay flat in freezer. When ready to prepare, remove from freezer and thaw. Cook in a crock pot on low for 8 hours. It's okay if meat is still frozen when you start cooking. Shred meat when cooked through with forks and serve on buns with additional barbecue sauce and coleslaw, if desired. Thinly slice cabbage, or process in small increments in food processor. This takes only a few minutes! Peel carrots and dice green pepper. Place all veggies in a large bowl with salt and let set for one hour. After one hour, drain and return back to bowl. Meanwhile, combine vinegar, sugar, celery and mustard seed in a small saucepan. Bring to a boil and let boil for one minute. Then remove from heat and let cool. Once cooled, combine with cabbage mixture. Divide into freezer containers and store in freezer until ready to serve. Recommend using within six weeks.